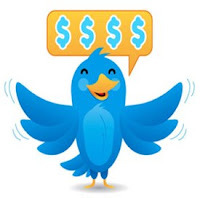 MOBIZ: Twitter worth $1 billion! Microblogging juggernaut Twitter is poised to raise about $100 billion in new funding, bringing the firm's total valuation to around $1 billion despite the absence of a discernible revenue model. Citing sources briefed on Twitter's plans, The New York Times reports the new investors include Insight Venture Partners, T. Rowe Price and current backers Spark Capital and Institutional Venture Partners. The Times notes that for context, Twitter's $1 billion valuation is bigger than many traditional businesses. With about 60 employees and experimenting running advertisements on its website, its still rather hard for many to understand how investors can come up with such valuation. Not sure why Twitter would need so much of that money as they had raised $55 million recently. Most speculation suggests Twitter will earmark the new investment to expand its technology infrastructure in advance of future growth, or acquire one or more of the myriad startups developing desktop and mobile software applications based on the Twitter service. Twitter presently boasts about 54 million users worldwide.